A renaissance of one of California's most threatened species of fish - the coho salmon - is transforming the meandering creeks and tributaries in Marin County's lush San Geronimo Valley into giant outdoor laboratories. There are more salmon in the waterways of this picturesque valley than any other place in California, and the winter rains seem to have created a population explosion. The celabrated fish wriggled their way up Lagunitas and San Geronimo creeks in huge numbers over the past four months and deposited more eggs than any other year since biologists first counted in 1982. The salmon run has had residents, tourists and wildlife biologists chattering giddily as the last stragglers lay their eggs and die. "It's absolutely the best we've seen," said Gregory Andrew, fishery biologist for the Marin Municipal Water District. "What's really unique about this year is we're not only seeing coho, but we're also seeing chinook and chum salmon." The region, on the northwest side of Mount Tamalpais, has become a statewide model for fisheries restoration. 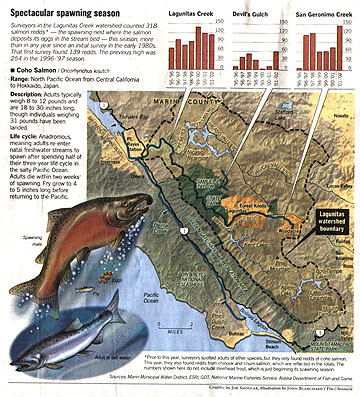 Experts say Lagunitas and San Geronimo creeks and their tributaries support 10 percent of the state's coho population. It is particularly valuable to researchers because the primary spawning areas are smack dab in the middle of communities. The annual run is drawing an increasing number of tourists, and the locals are beginning to take a proprietary interest. The schools have even gotten involved, teaching children about the historic migration and organizing work parties to restore portions of the creek. It is an encouraging sign, given the history of neglect in an area that once boasted the best salmon fishing in all of California. Before dams cut off 50 percent of the spawning area, old-timers told stories of how they used to gig fish from decks or garages overlooking the creek. In 1959, when the habitt was already in serious decline, the largest recorded coho in state history, a 22 pounder, was fished out of the creek. Dams, urbanization, poor grazing practices, logging and gravel mining combined to drastically reduce the salmon habitat in Marin County and throughout California. In 1996, after a century of abuse, coho were listed as threatened under the Endangered Species Act. The Marin water district is now almost as passionate about the restoration program as the members of SPAWN (Salmon Protection and Watershed Network), who have worked with the district monitoring releases from the dam, installing woody debris in the creeks and replanting vegetation. One of the biggest success stories was an all-volunteer effort to build jump pools for salmon at Roy's Dam, which is located on a private golf course. The dam is now a favorite spot to view the migrating fish. On one recent day, virtually every golfer passing Roy's Dam stopped to look at the salmon and talk about their spawning habits. For Steiner,the director of SPAWN, that in itself was a victory. "We're all part of the problem," he said, "and we all have to be part of the solution."